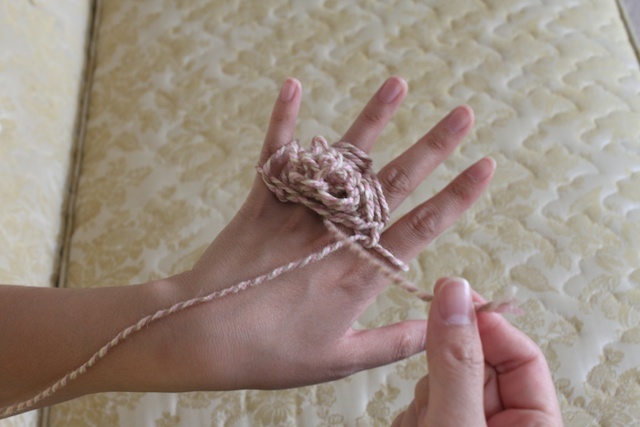 This is a fun summer luau tutorial, a yarn lei. I decided to tap into my Hawaii childhood and teach you to make a lei with something you can find in non-tropical locations. It’s one of those things that every child learns to do in Hawaii. And if you are thinking of doing a summer luau, this could be a fun activity for the children to do. It will keep their hands busy and out of trouble. If you made something inspired by Simply Modern Mom, please upload pictures of it in our Flickr group to show it off to everyone. You may be featured on Simply Modern Mom. 1. 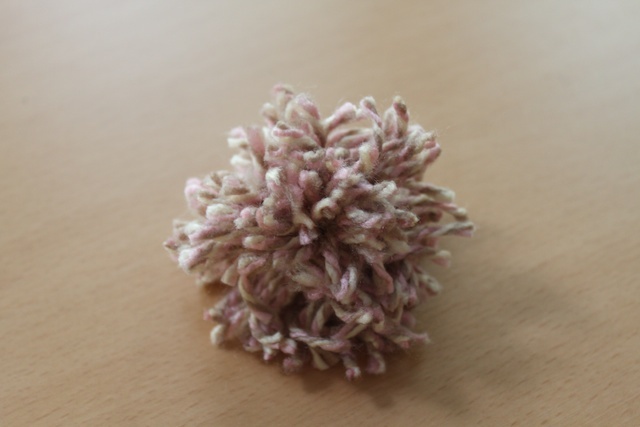 Take the tip from the ball of yarn and have it come from back to palm of your non-dominate hand. Don’t cut the yarn from the ball. You don’t know how much yarn you will need yet. 2. 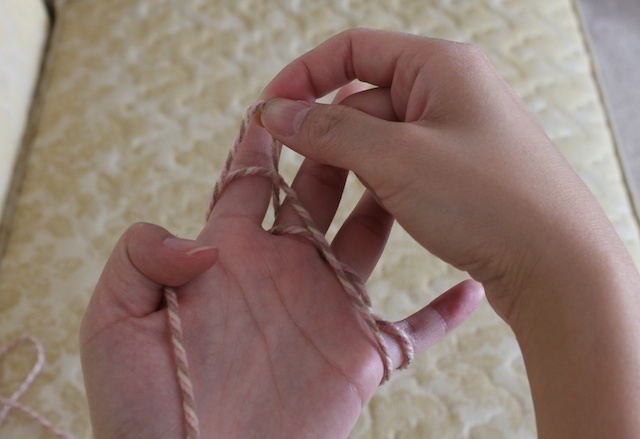 Wrap it around you fingers going from the back of your index finger (pointer finger) to the front of your middle finger. Then to the back of your ring finger and front of your pinky. 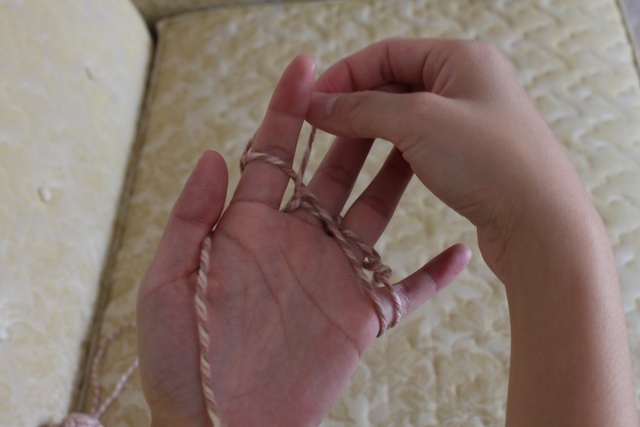 At the pinky, you’ll loop it around to the back of it and wrap the other sides of all your fingers (except the thumb). 3. 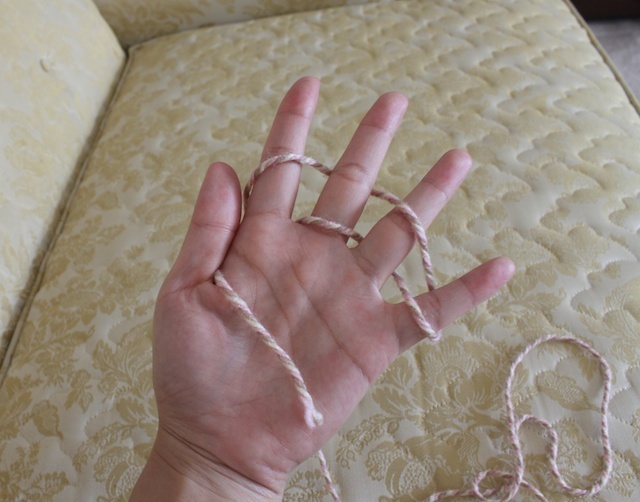 Take the yarn and wrap it around the palm of your hand by going back to front and leave the yarn dangling at the back of your hand placed between the thumb and index finger. 4. 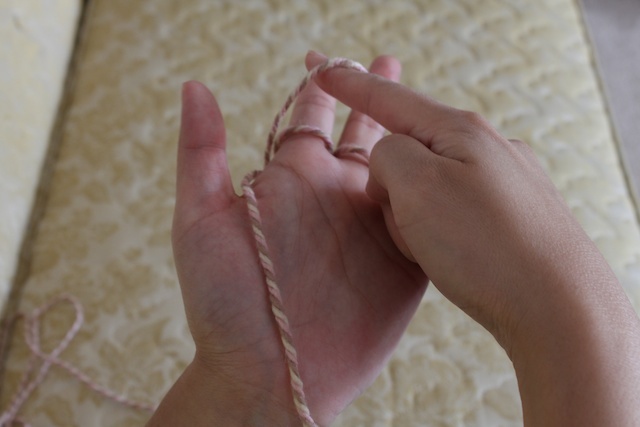 Lifting the straight line that is at the palm and going under it to pick up the yarn loop that is at the index finger. Pull it up enough to put your index finger through the loop. 5. Then do the same thing to the middle, ring and pinky finger. 6. Repeat step 3 through step 5 about 10 times. It should start gathering at the back and look like a huge lump. 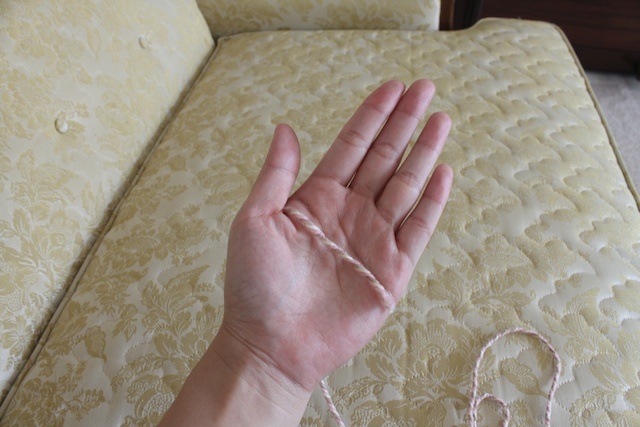 Take the opened end of the yarn and pull on it gently so the gather turn into the lei. 7. 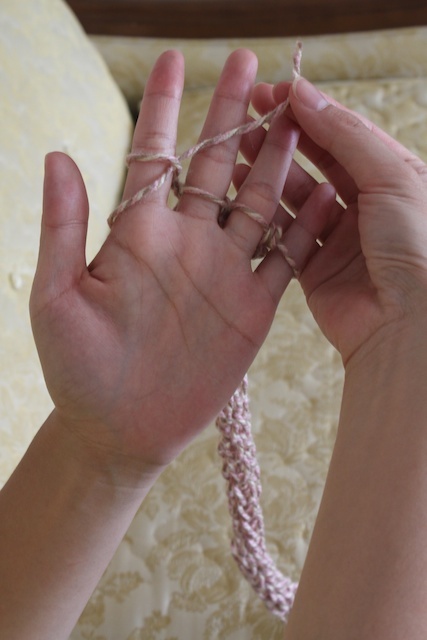 Repeat step 3 through 6 until you reach the desired length of your lei. Then cut the yarn from the ball of yarn about 5-6 inches out. 8. 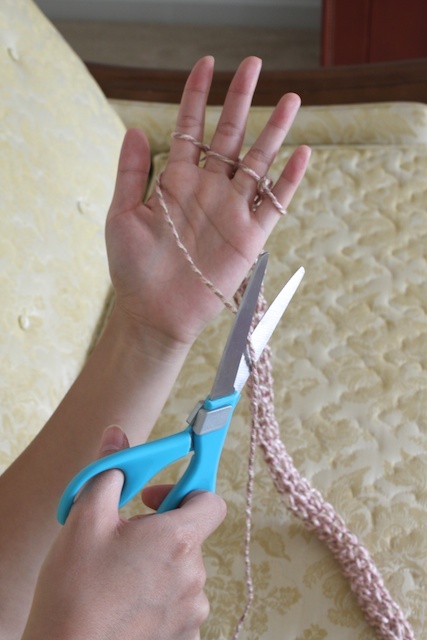 Take the newly cut end and pull it through the index finger loop from bottom up. And repeat to other fingers, always going from bottom up. 9. 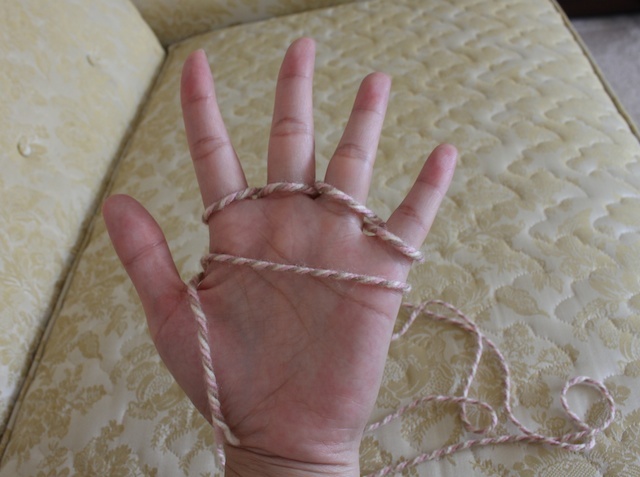 Once you have put the end through all the loops of the fingers, take off from the fingers and pull tightly on the end. 10. 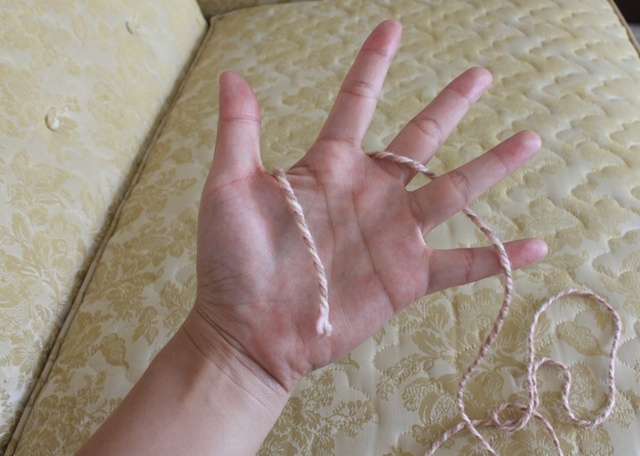 Tie the two ends together to make the lei. 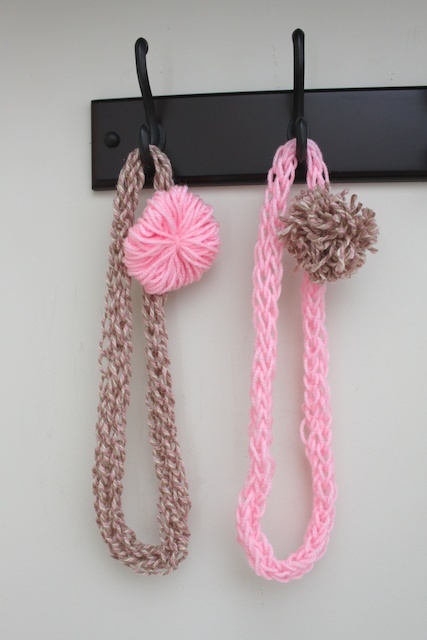 You can add a pom pom or a yarn wheel to where the two ends meet to cover it up better. 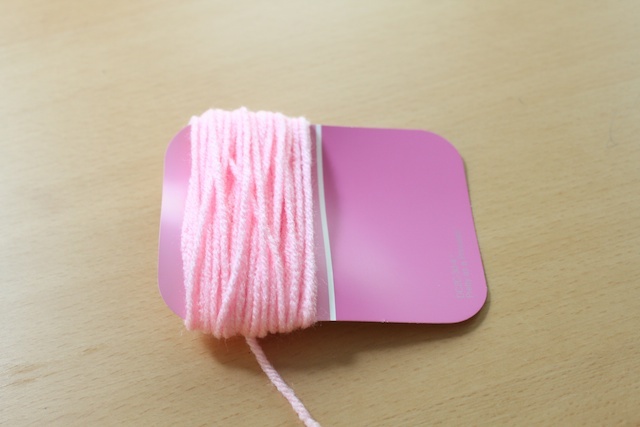 To make the yarn wheel, you take a card about 4 inches in length. 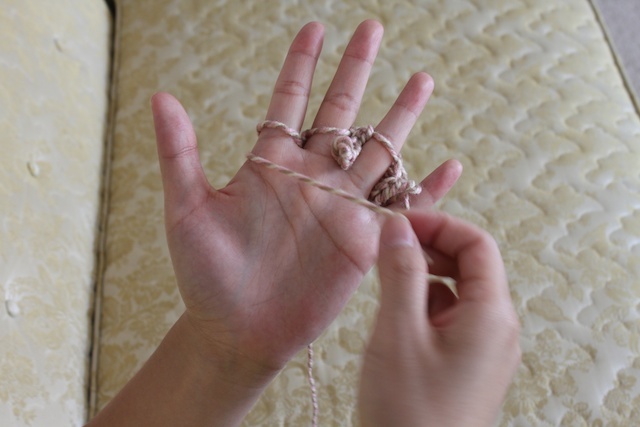 Wrap the yarn around that several times. The more you wrap the fuller the wheel. 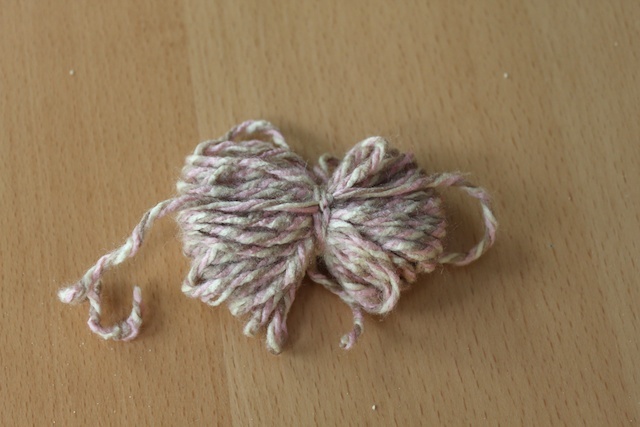 Then take a piece of yarn and tie the middle in the opposite direction of the rounded up yarn. 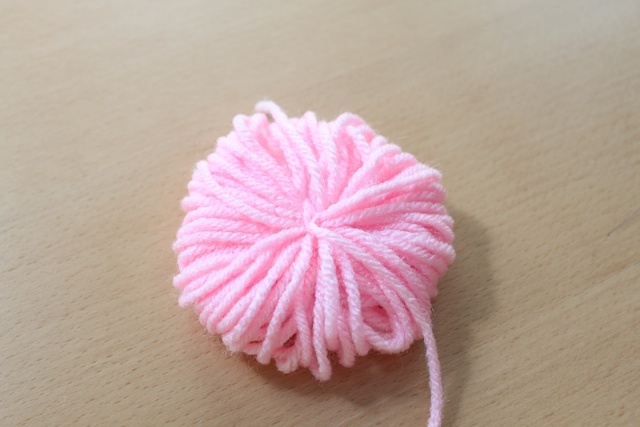 To make the pom pom, do the same thing as the wheel, just cut the rounded yarn at middle of the loops then fluff. Aloha! » Tell me… Have you been to Hawaii before? Which parts? Did you like it? This brought back memories from my childhood. 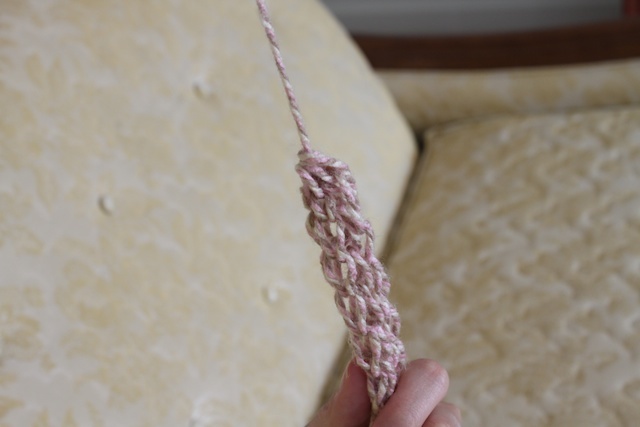 My grandmother taught me how to do this and I remember sitting there for hours while she watched her soaps, making these. I haven’t been able to find a tutorial since becuase I didn’t know what they were called. Thank you SOOOO much! You really have no idea. 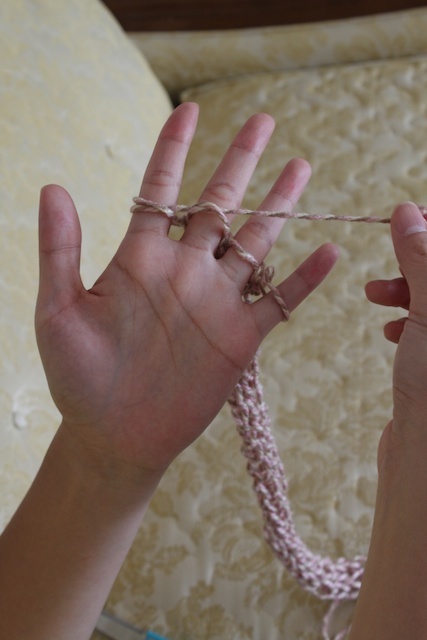 so the yarn lei tutorial is helpful for you! This is so great! I have a grand niece I want to share this with. hi audrey! glad to have you. and i lived in laie too. isn’t it wonderful? Thank you so much for the easy to follow instructions! I’m from Hawai’i too and I use to make this with my cousins when I was a little girl. My daughter wanted to learn how to make it and I totally forgot how to thread it thru the fingers! This was super helpful and just in time for graduation season! Are there any tricks for making them tighter? This brought back memories! I now live in WA. I ended up buying a roll of yarn for my 9 yr old and found this tutorial since I forgot how to do it and she ended up makes 3 the same night. She made one for her teacher who ended up wearing it for 2 days and a fewof her classmates asked her to make one for them. Thank you again!! !